A geometric distribution G(p) with parameter p provides a probability model for the number of trials up to and including the first success in a sequence of independent trials. where q = 1 - p.
For example, we could make a model of a DNA sequence that contains CpG islands, where we assume that, travelling from 5' to 3' along the sequence after entering a CpG island, there is a probability of p of leaving it, and q = 1 - p of staying in it, at a subsequent base position. 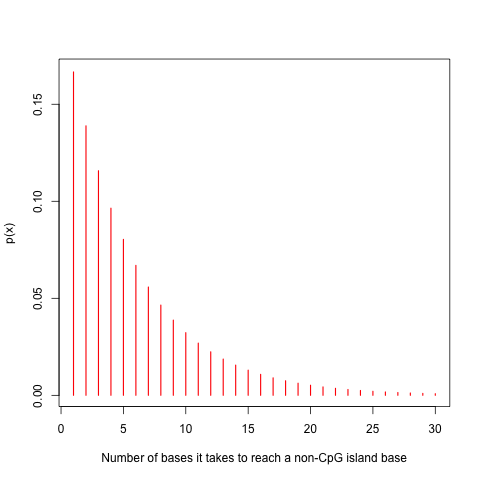 Thus, assuming we start off within a CpG island, p(n) gives us the probability that we will have to look at n bases along the sequence to see the first non-CpG base. 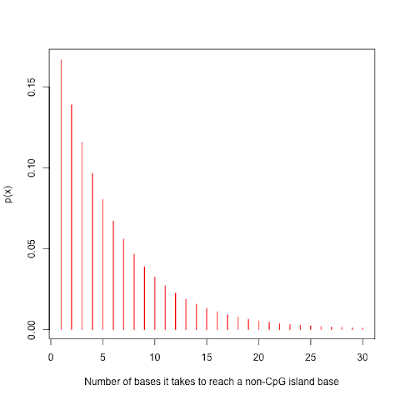 In other words, we are taking a non-CpG island base to be a "success", and p(n) gives us the probability that we will have to look at n bases (n trials) to see a non-CpG island base (a success). which is equal to 0.1157407, which is 0.116 rounded to three decimal places. In R we can calculate this using the "dgeom()" function, which calculates the probability mass function (p.m.f.) for a geometric distribution. which is 0.4212963, or 0.421 rounded to three decimal places. The "pgeom()" function in R gives us the cumulative distribution function (c.d.f.) for a geometric distribution. To see an example of use of geometric distributions in research, you can look at a paper by Hsieh et al (2009), who modelled the lengths of CpG islands in the human genome using a geometric distribution.